On-line Applications for Graduation are due the semester BEFORE you plan to graduate. A different on-line application for graduation is due for every semester that you attempt to graduate. If you do not graduate when planned, you must fill out another on-line application for graduation. A separate form is required to be turned in to the registrar's office by March 6, 2019 (subject to change) if you want to graduate in the summer but walk through spring graduation. If you are asked to Select the Current Term, then select the current semester in the drop down box. Do not select your graduation term here. Press Continue. If your concentration or minor are not correct on the Curriculum Selection screen, they must be fixed immediately after you apply to graduate. Catalog Year: If you have decided to move to the new ME curriculum, your catalog year must be changed accordingly. This can be done by filing out a change of major form. You can see which catalog year you are on by looking at your DegreeWorks audit. Minor: If your minor is not declared, is not correct or if you are no longer pursuing a minor, you must fill out a change of minor form to correct it. Concentrations: If you are pursing a concentration, you must declare your concentration in OSCAR. Students who have two majors can only select one major at a time; you will need to complete this entire process for both majors. If you use a different name on the Diploma Name Selection screen, the registrar’s office will review all name change requests. On the Diploma Mailing Address Selection screen, select the address where you want to send your diploma. NOTE: Diplomas are mailed approximately 8 weeks after graduation so plan accordingly. Changing your Graduation Term - If you need to change your graduation term, send your advisor an e-mail asking that your on-line application for degree be changed to inactive for the term. This must be done before drop day of the semester you petitioned to graduate, but the sooner the better. A new on-line reapplication for graduation must be submitted for the new semester which you plan to graduate. The 36 Hour Rule - A student's last 36 hours must be taken in residence at Georgia Tech. Students who plan to take a class at another university within the last 36 hours must Petition the Faculty to ask for a waiver to this rule PRIOR to taking the class. The 10 Year Rule - Course work over 10 years old will not be used toward a BS degree. Students with course work more than 10 years old must Petition the Faculty to use the old coursework. Graduation Survey - If you do not complete the Institute Graduation Survey and want to return to it at a later time, use this link to complete the survey. If you correctly applied to graduate, you can see it on the degreeworks audit in the Graduation Information box. Click here for a screen shot with more information. If you have not applied correctly, your graduation information will be blank. When you initially apply, your graduation information will say Active Application - On Track to Grad, 2nd Audit. After the registrar audits your status, about 2-3 months into your last semester, your graduation information will state your status. Minors - If the minor requirements are not listed in degreeworks, then students who are earning a minor must submit a signed minor program of study form to the registrar's office to receive their minor. PLEASE NOTE THAT MOST MINORS ARE AVAILABLE IN DEGREEWORKS AS OF FALL 2016. Minors are noted on your transcript, but they are not on your diploma. The minor program of study form requires a signature by the department offering the minor and your academic advisor's signature BEFORE you turn it into the registrar's office. This form is different than the minor declaration form. Certificates - Certificate forms are not turned in with the degree petitions. They are turned in directly to the department offering the certificate. You must ask the department offering the certificate for their form. Certificates do not show up on your diploma or transcript. International Plan - All IP students who plan to complete the program must submit the International Plan Degree Designation Form to the registrar's office separately. This IP form requires an IP signature and your academic advisor's signature BEFORE you turn it into the registrar's office. The International Plan is a degree designator and will show up on your diploma and on your transcript. Concentrations - No form must be filled out, you just need to make sure that your concentration is declared in OSCAR. Currently concentrations will not show up on your diploma or on your transcript. We are hoping that they will show up on your transcript in the future. All students must review their DegreeWorks audit. DegreeWorks is the system that is used to verify you are eligible to graduate. It is completely your responsibility to verify your DegreeWorks audit is correct and all of the requirements are met. Log into DegreeWorks. Select Degree Audit System under the Essential Links heading. If you have any questions about your DegreeWorks audit, then contact your academic advisor. First Audit – This audit begins after Phase II closes and is completed mid-semester. NOTE: if after First Audit, there are deficiencies on your status that cannot be resolved with final grades (such as LOW GPA, PENDING TRANSFER CREDIT and REGISTRAR ADMINISTRATIVE DEFICIENCY), then you will be inactivated as a degree candidate. You will then be required to reapply for graduation for the next semester. Second (Final) Audit - The final audit occurs on the Tuesday following Commencement, after all of the semester grades are available. Inactivation Date – The inactivation date is when all students who have not cleared up their deficiencies excluding the ones listed above will be changed to inactive automatically. This occurs approximately one month before Commencement. Log into DegreeWorks by selecting Degree Audit System under the Essential Links heading. Near the top of your audit, under a section titled Student View, you will see a field Graduation Information. The text that appears in that field is your current degree status. Click here for a screen shot with more information. Overall GPA: Your truncated overall GPA must be 2.00 or greater (no rounding up) to graduate. Major GPA: Your truncated major GPA must be 2.00 or greater (no rounding up). If you repeat any classes used in your major GPA, only the latest grade will be used in the calculation. ME students on certain catalog years have a limitation on the number of D's as well. Click here for the Major GPA requirements. When GPAs are Evaluated: Your Major and Overall GPAs will be verified AFTER final grades are posted during your last semester. If you do not have the required 2.0, you will not be able to graduate until both your overall GPA and your major GPA are both above a 2.00. Honors on your diploma will be based on your final grades, but honors at graduation will be based on your grades as of the semester prior to graduation. In order to eligible for honors you must earn 60 credit hours at Georgia Tech. If you do not have 60 credit hours you will not be eligible for any honors, regardless of your GPA. Click here for the honors levels and GPA requirements for each level. Click here for degree candidate frequently asked questions. Click here to RSVP for commencement. Tickets are required. Click here for ticket information or see the FAQ's page about tickets. Click here for information about commencement. Click here for information about caps and gowns. Click here for information about announcements and class rings. There is no longer a commencement ceremony in the summer semester. Summer degree candidates are invited to participate in the fall semester commencement ceremony. All summer graduates wishing to participate in the fall ceremony must submit an RSVP during fall semester to receive guest tickets and participate in the ceremony. Undergraduates who have two or fewer classes remaining to complete degree requirements after the spring term may ask to participate in the spring ceremony. These students are required to apply during a special window in March and must meet all of the requirements outlined by the registrar's office. This option is subject to change, depending on space available at graduation. The registrar has final say on whether this option will be available each year. 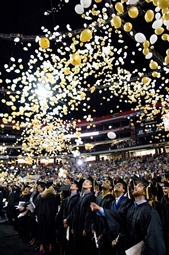 Important information about how to graduate in summer and walk through spring graduation is available each year on Georgia Tech's commencement website.